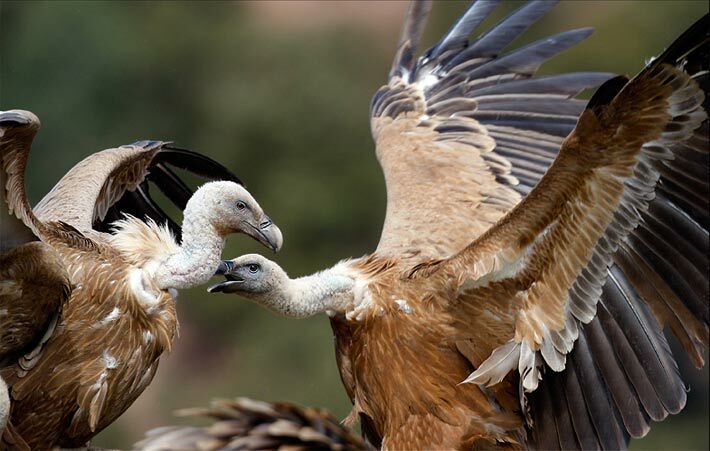 Griffon vultures are old world raptors found throughout Europe and Asia, as well as in parts of North Africa. It is alternatively called the Eurasian griffon. 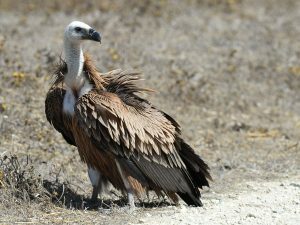 Size: These birds are between 37 and 48 inches (93-122 cm) in length. Weight: Males have a weight of around 14-23 lb (6.2-10.5 kg) while females weigh 14-25 lb (6.5-11.3 kg). 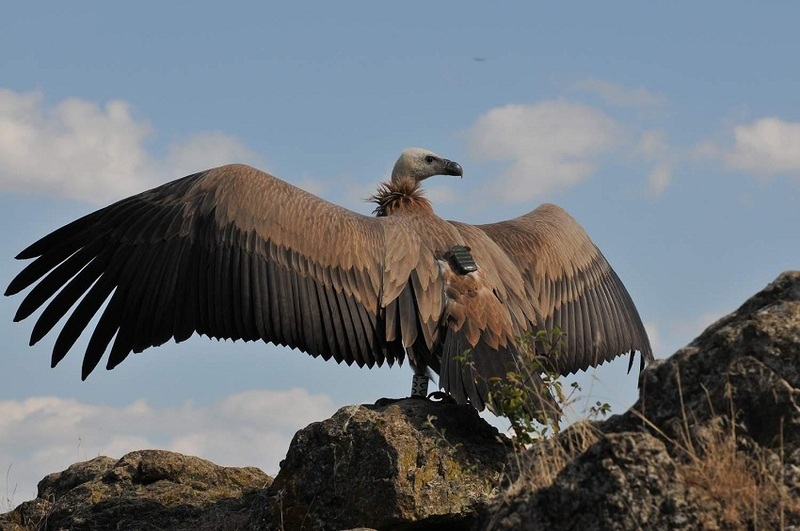 Wingspan: Unfurled, the wings measure around 7.5-9.2 ft (2.3-2.8 m). Color: They have a creamy-white head, neck, and ruff. The upper wing and the body is a pale brown, while the tail and remainder of the wing is a striking dark color. 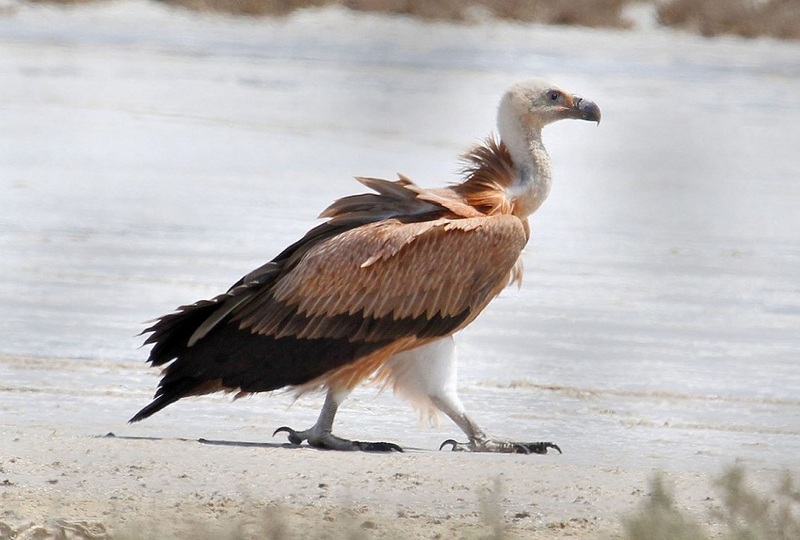 This raptor can be found over most of Europe, North Africa, Middle East, through Afghanistan, Pakistan, India, and into Nepal. The largest population occurs in Spain. They appear in a variety of habitats including plateaus, mountains, semi-deserts, shrublands, and grasslands. Warmer climates are preferred, but they can withstand rain, mist, cold, and even snow. 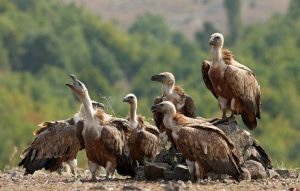 These birds fly around in flocks and are known to rely in part on their neighbors spotting carrion from the high altitudes of their flight. 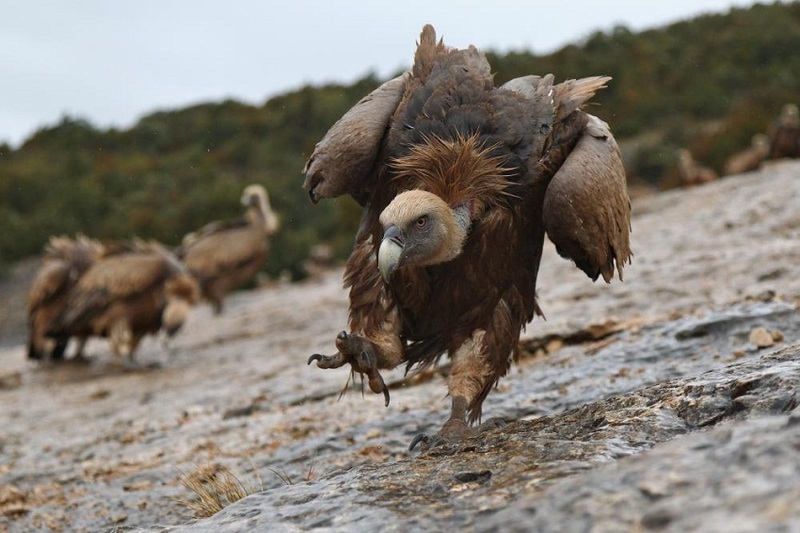 The cooperation ends once they are near the carcass, at which point they engage in intimidation displays and disputes until one of them walks to the carcass to start feeding. After they have fed on a carcass, they will look for a body of water to plunge into and wash away the blood on their body. 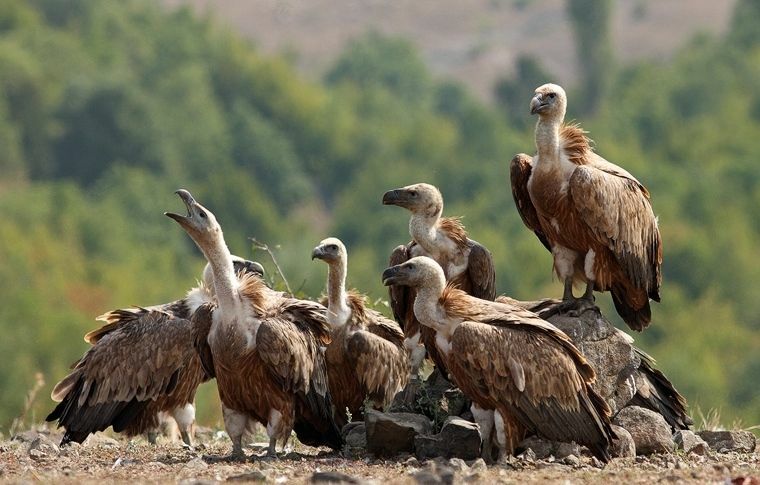 Then they spread their wings for as long as it takes the plumage to dry. 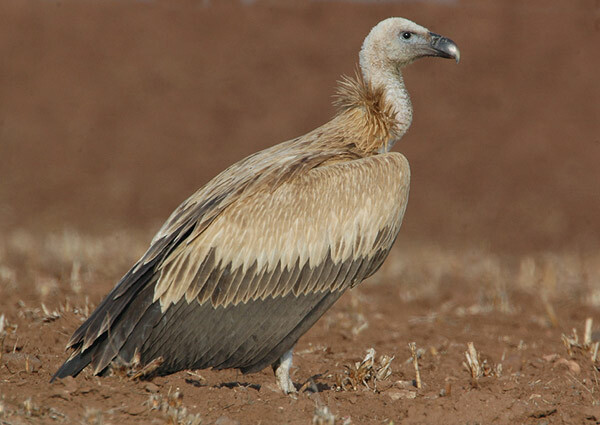 Being a scavenger, griffon vultures feed mainly on carrion. They may also sometimes attack old and weak livestock. They breed in colonies consisting of up to 150 pairs. They make their nests in cliffs, and elegant courtship flights can be observed around this area. These birds mate for life. The breeding season starts before the end of January. The clutch consists of a single egg, incubated by both parents for around 52-60 days. At the end of this period, a rather weak and featherless hatchling is born, weighing approximately 6 oz (170 g). The hatchling stays under its parents’ care for around three months. It fledges after 110-130 days. They become capable of breeding after 4-5 years of age. They live for around 25 years in the wild. In captivity, one individual lived for more than 41 years. These are noisy birds, and communicate using a wide range of vocalizations, for example, hisses and grunts can be heard when they are feeding, while a woody chatter is emitted when another bird gets to close. 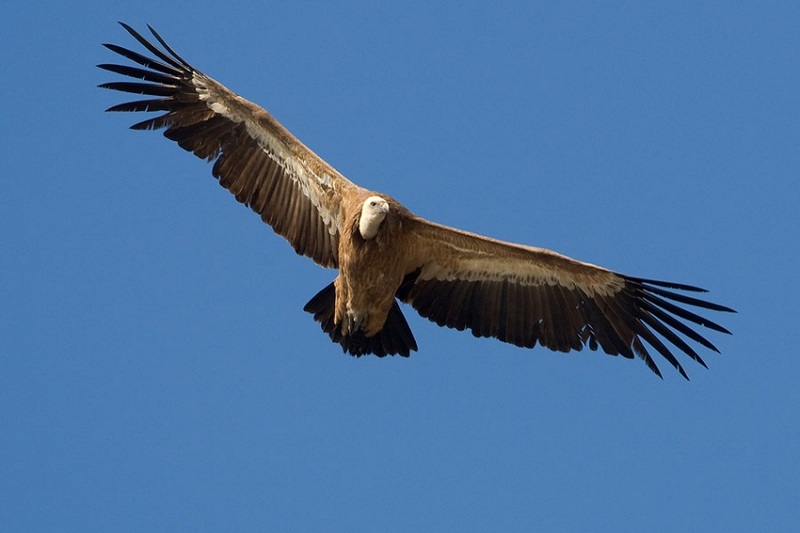 The large wings help these birds to soar high in the air without flapping them for hours. This helps them conserve energy that would be spent if they flapped the wings. Their exceptional eyesight aids them in spotting carrion from high up in the air. These vultures can thermoregulate without the help of metabolism, thus allowing them to restrict energy and water loss. These large birds do not have any natural predators. The IUCN lists the griffon vulture under their ‘Least Concern’ category. 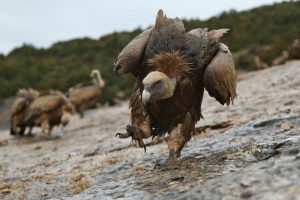 The Himalayan vulture was considered to be a subspecies of the griffon vulture but has since been assigned species status of its own. 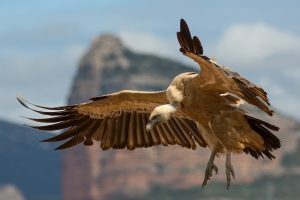 These birds are one of the most gregarious among raptors.